In celebration of the official Air Mag unveiling, today's Photo of the Day had to be McFly-inspired. Today will undoubtedly go down as one of the greatest days in sneaker history. The buzz surrounding the 2011 release of Marty McFly's Nike Air Mag from Back to the Future II is at a level we have never seen for a shoe before. Not only are sneaker enthusiasts tuned into tonight's big announcement by Tinker Hatfield, CEO Mark Parker and the Nike team, but movie buffs and tech geeks are plugged in as well. This may very well go down as the biggest sneaker release in history and we're all here to witness it first hand. In celebration of the official Air Mag unveiling, today's Photo of the Day had to be McFly-inspired. 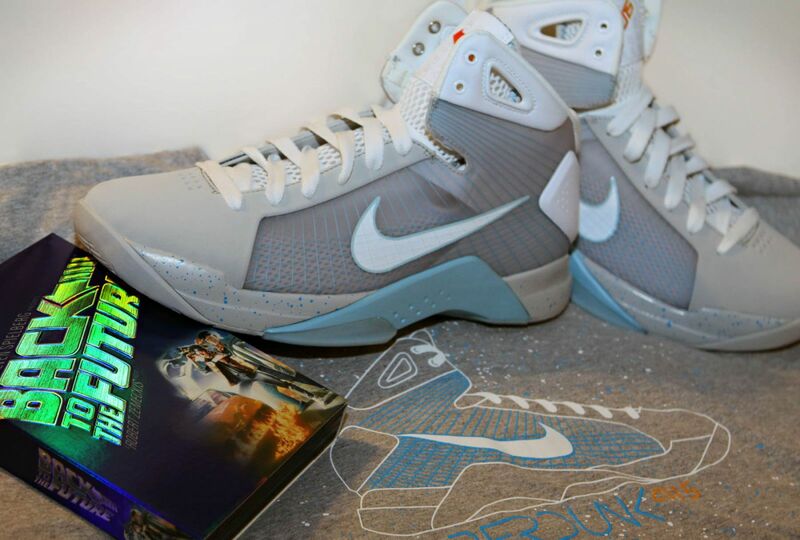 A while back, my friend Chris Morris from G2C Designs sent me this picture of his "McFly" Nike Hyperdunks, complemented by the matching t-shirt and 25th Anniversary Back to the Future Trilogy boxset. Definitely a perfect picture to share with you all as the day's events continue to unfold. Click on the photo below for an enlarged view and keep checking SoleCollector.com for the latest on the official Nike Air Mag unveiling tonight.